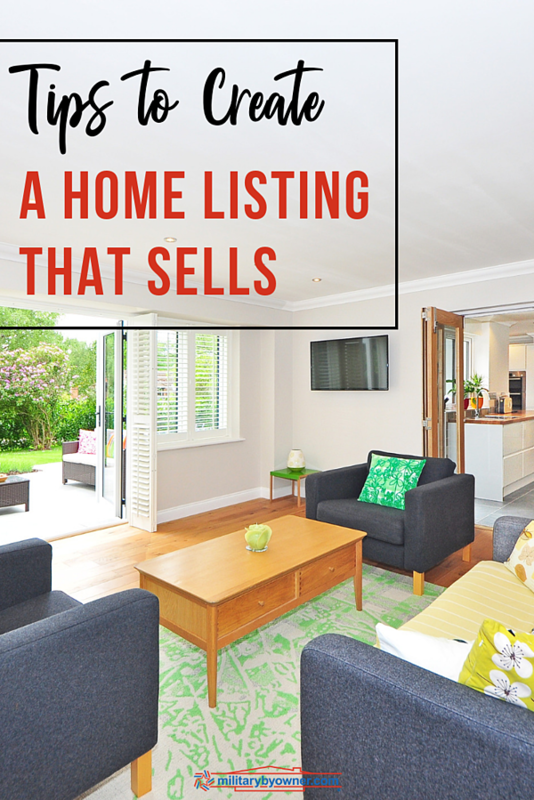 If you’re not a real estate professional, then creating an unforgettable home listing might feel a little overwhelming. But it doesn’t have to be! 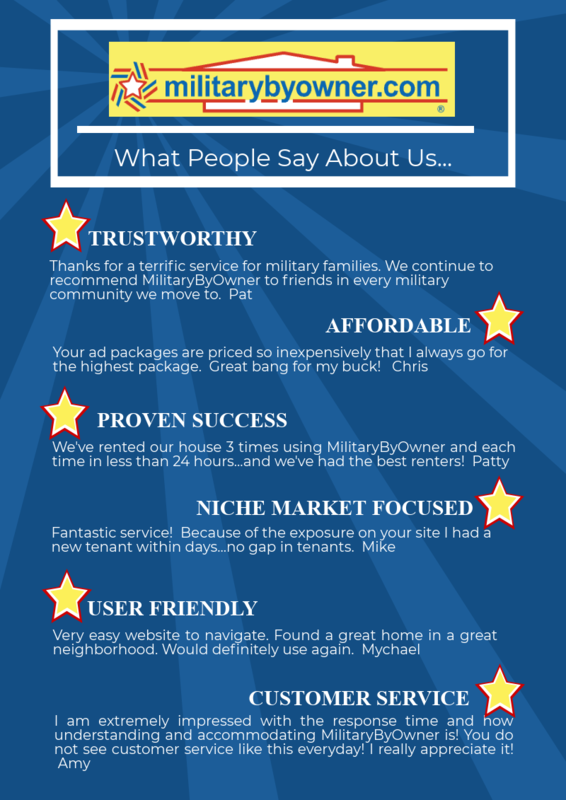 With a few helpful tips from your friends here at MilitaryByOwner, you’ll have what you need to get a fantastic listing up and running in no time. So, let’s get started! When you’re sitting down to write about your property, remember why you bought the home. Reflect on what compelled you to buy it. Chances are, someone else will fall in love for the same reasons! You don’t know how much home buyers and renters know about the area, so assume their knowledge is very little. When they come across your listing, they might be shopping for both a home and an area, and it’s your job to convey both to them. Interested parties can tell from your photos if the house is a good fit with their favorite features, but it takes your insight to help them know if the area is, too. Be sure to include details like proximity to stores, schools, restaurants, churches, and the base. If it’s a large military installation, include which gate is closest and what traffic is like. Convenience is everything, especially for people new and unfamiliar with the area. Home buyers and renters are shopping for more than the home itself. They’re going to be looking for a neighborhood that’s also a good fit and, on some occasions, the right neighborhood might outweigh the ideal home. Talk about the character of your neighborhood. Do the majority of your neighbors have kids? Are there sidewalks, playground, dog parks, and walking trails nearby? Is there a neighborhood pool? These are the kinds of details that you might take for granted but will appeal to potential buyers. Home buying is, at its very core, a financial transaction. But, it’s also an emotional decision. While buyers want to know that the property checks all their boxes, when it comes down to it, they’re going to pursue a home where they can envision their lives. Don’t get too caught up in using the right words that you forget to paint a picture of life in your home. We know that most home buyers and renters search for a home by photos, which means you need your photos to sell. Hiring a real estate photographer may be money well spent. However, if you feel like tackling this project yourself, go for it! Just be sure that you follow the tips we laid out in 3 Easy Steps to Take Amazing Photos for Your Home Listing. Note: You can always update photos after your ad has been created. So, if it was cloudy outside the day you took pictures of your home's exterior, you can wait for a better day, retake them, and add them to your listing then. You can’t secure a buyer or renter if you never get connected! Not only should you be sure to include an appropriate contact method in your listing (not an email you rarely check), but it’s essential that you respond to all inquiries in a timely manner. Note: Be aware of time differences. Since most of our customers are military families, they live all over the world. If they happen to leave their current duty station in their message, try to factor in their time zone when you return their call. Once your listing is up and running, share where you can. Social media is a great tool to reach large audiences. Post the listing personally and (if allowed) share within specific Facebook groups that way you can reach families across the military. Why do we share tips to help you improve your MilitaryByOwner ad? Because we want you to be successful! We’re proud of the work we do, and you can find us doing a little dance each time we hear success stories from our customers. With house hunters turning to the internet, your online listing is everything. It’s your chance to make an unforgettable first impression and create enough interest to get them in the door. While these tips should provide a great starting point for you, we know that you’ll have more questions. Check out our free FAQ’s ebook. And, as always, contact our outstanding customer service team with any questions or concerns you might have. Want to meet the people on the other end of the phone? Get to know them here!